By the food we eat, can we change the world (or not)? As you may remember, we started talking about this issue following the publication of an article “Organic Agriculture and the World Food System” by Netdao Taotawin, which points out the weaknesses and limitations of organic agriculture. She finds that there has been a tendency for organic farming to become a new market for agri-businesses, rather than a solution that might lead to setting up a new market with new production relationships, or new consumer campaigns. In other words, if we do not move beyond changing individual behavior, focusing only on health, or talking only about food as if it was some kind of garnish of the good life, it is unlikely that we can resolve any of the complex structural problems facing our food system today. As one of the advocates of the “Food for change” campaign, I couldn't agree more. At this time, the group of people who are in the greatest hardship relating to food, are probably the full-time consumers (meaning those who do not have or do not use land for cultivation and are not food producers themselves). They are concerned about the food they eat, whether it's out of concern for themselves, or for the environment, or for the small-scale farmers or even a deep devotion to social justice. But they have very few choices since “the capitalist system has created the conditions to squeeze and control consumers”, as Netdao has put it. Therefore the main issue is how we can mobilise consumers to see the importance of building a good food system – that is a system that produces good, safe, and affordable food, that is fair for both producers and consumers. This would be a system which could respond to the needs of rich and poor alike as a fundamental right. To achieve this kind of food system, we need a strong political voice to push the government to set up public policies and standards to bring in a good food system for all, not just for those who have the money to access good food. The first “food for change” festival learned from and adopted the principles of the Slow Food movement to begin communicating with the public. Those principles can be summarized in three words: Good, Clean, Fair. Good refers to good food, which is nutritious, beneficial and delicious. Clean refers to clean production processes, that are environmentally friendly, do not leave chemical residues, and are safe for producers. Fair refers to food producers having a satisfactory income, food sellers can make their living, at a price that consumers can accept and is affordable. All that we encourage people to do is to select and be choosy about eating fresh food, unfrozen, unprocessed, which does not have to travel unnecessarily far and to buy some of their food from farmers markets and local shops. We don’t go as far as talking about organic food. These days, in Europe, or even in America, fresh local food not easy that easy to find. We may think that in our country, it would be easy, but it turns out it’s just not as easy as we thought, as eating trends in our country are changing fast. Who would have thought that in the space of just 10 years Thai people, who have such a rich food culture, would have changed their eating habits this much, relying on frozen ready meals from a microwave? One other major problem relates to food knowledge. In their daily lives, consumers are distanced from the production system. They lack knowledge of the source of their food, or how it is produced. They no longer tend to pass on knowledge about food preparation to other members of their household, and find it hard to understand the confusing and conflicting messages from advertising about healthy food. All this leaves us with very little choice. Therefore “Food for change” only invites consumers to ask questions and look into the origin of the foods that they eat three times a day (at least). But we also have to sit and tell them bad news almost every day - don't believe the advertising on this too much; you know that hydroponic vegetables are not organic vegetables, right? ; vegetables with the Q label have as many residues as the veg you would buy from a street stall, etc etc. It’s worst when we tell it to people straight - that if you want to eat safe food right now, it is almost impossible. We have to put up with it. Just as in our work with the producers, what we can do is invite consumers - those who know that their choices are important, and have the means and the conditions to be able to choose - to take action whenever they can. Start by going to a local fresh market (talaad sot) from time to time, ask the shopkeepers questions from time to time, try tasting unfamiliar local vegetables. Looking for information about seasonal vegetables is not so difficult. Fry your own chicken pad kraprao dish with a fried egg on top when you can. Use the tiniest, darkest of the basil leaves, and you will start to notice the difference between the different herbs. Practice making favourite foods which your mother used to cook for you. If you can, call your mother for the recipe. Or if you have the artistry to put together your own curry paste, or press coconut juice direct from the fruit, try it once in a while. These are hardly the kind of strange or eccentric foods that come with a warning “don’t try this at home, folks”. Devotees can go as far as to grow their own vegetables. But even if you can’t change anything, just wondering about it from time to time, is still better than eating without thinking about anything at all. Having observed the local food movement around the world over the last few years, the local food movement has expanded very quickly throughout the West and has begun to make interesting linkages between the anti-capitalist and anti-globalisation movements. We can go back to Carlo Petrini, an Italian journalist who loves and values the art of cooking, who became a central figure amongst a group of idealistic friends opposed to the threat from the giant global food business McDonald's which was opening branches in Rome around 1986. He set up the Slow Food movement in 1989 as an antithesis to “fast food”. Since then he set up the Slow Food Festival and the Terra Madre network, in 2003, certifying over 170,000 food producers from every corner of the globe including peasant farmers, chefs, pastoralists, fisherfolk, seed collectors, beekeepers, bakers as well as linking with students and academics (from a start of only 5,000 people initially). The purpose of the Terra Madre network is to exchange ideas and experiences, everything from secret household recipes, trying new local foods and drinks, to setting up a network and a common vision. Starting from an association of people who have good taste to becoming an inspiration for strengthening and developing networks of local food producers and to defining “slow food” as food that is good, clean and fair. This means food that is of good quality and good flavor, has been through a clean process and respects nature and is fair in the sense that producers have dignity and earn a decent wage and are respected by consumers. From 2005 – 2006, the local food movement expanded towards promoting the produce of small-scale farmers, what the Americans call “family farmers”. Consumers are turning to freshly produced foods, grown in local farms not far from their homes. From a small number of elite markets catering for affluent people concerned with their health, food producers have expanded to farmers markets which have grown from dozens to thousands of places throughout Europe and America in the space of just three or four years. Now there is a City Farm movement and a new generation of young farmers, men and women from the big cities who are looking for their own agricultural land. A new membership system called community supported agriculture (CSA) has been established and is expanding fast in many American states. If we look beyond the concept of “slow food”, Prof Tim Lang of the Food Policy Unit at City University, London developed a discourse on “food democracy” in the mid 1990s in response to the expansion of corporate control over the food system and the fact that consumers have no control over any part of the food system. This concept proposes that people should have the power to set food policy and action at the local, regional, national and international level, with the aim of guaranteeing access to affordable, healthy food that is compatible with the local food culture, and emphasises social justice in the food system in the belief that food is at the heart of the process towards sovereignty. When the Occupy Wall Street movement began in September 2011, the local food consumers movement, peasant networks and seed growers in America actively joined forces. 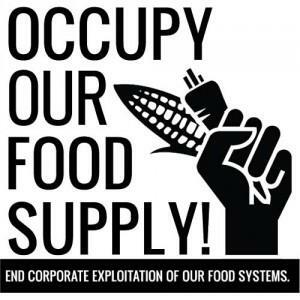 Soon after, they set up a movement called “Occupy the Food System”, which proposes seizing back the food system from the control of giant corporations. Small restaurateurs marched together with farmers and their networks. They collected foods which had been thrown out by the supermarkets because they were outside their expiry dates but which are still edible. In Europe, a “Good Food March” was organised in which consumers and producers starting out from different cities in Europe marched towards Brussels at the end of August 2012, where at that time, decisions were being taken on the Common Agricultural Policy of the European Union. Coming back to Thailand, we don’t expect that an active movement of well-networked producers and consumers would be set up so fast. However what we have learned from the development of the consumer movements in the West is that this is not an impossible dream. It is a pity that so few social observers, academics, or journalists have tried to understand or work on this concept. Whatever their reservations, we could analyse these together to find ways to improve our future work. It would be much more helpful if critics could be more meticulous in identifying our weaknesses, based on the documents, concepts and activities that we are actually working on. Criticism which gets stuck on a few terms or uses a few images to distort the discussion does not help. If we look at the references cited at the end of the “Organic Agriculture and the World Food System” article, there is little evidence that the author studied our movement or any of our publications. Citations referring to Thailand, include only a 10-part documentary called Rice, Fish, and Food. It's not certain whether all 10 episodes were watched or not. This is probably not enough information to help analyse our movement or help build transformative action towards a food system that is good for everyone.